After LFCC in July and the amazing experiences I had at Trekology I was really looking forward to this event. As many of you may know going to conventions is new to me but I am fast realising how much I have been missing out on over the years. 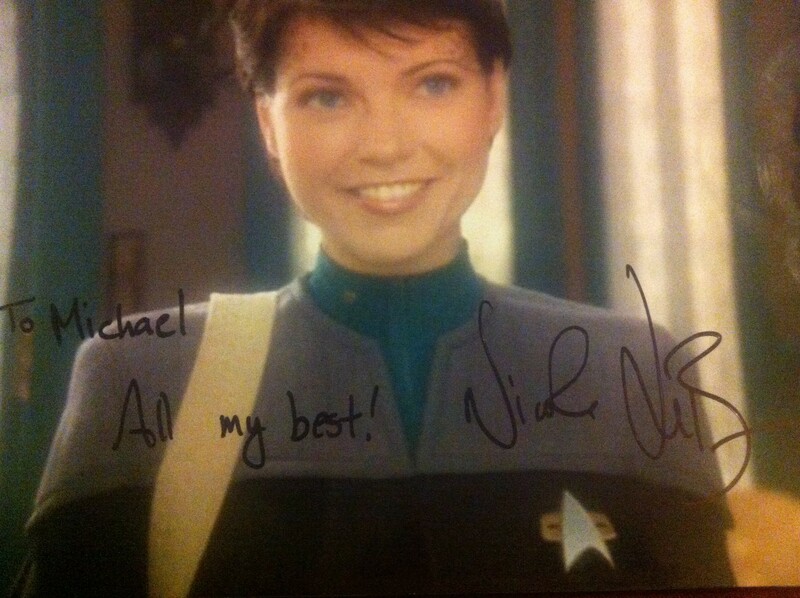 Being a Star Trek fan I was of course excited that I would be seeing Nicole de Boer from DS9 and hopefully catching up with Garrett Wang who I had met at Trekology. As always though the real highlight was spending time with Bunny, Laura, Jon and all the other friends I have met these last few months. Unfortunately Matt could not attend and we really did miss him. The first challenge of the day was actually getting to the event! I had not bothered to check if there were any engineering works on the Northern Line so I arrived at the station to find a replacement bus service. I ended up catching two buses, walking across central London and finally two tubes to Olympia. I am sure this is a rookie mistake when going to a con and one I won’t repeat. I know Bunny had even more of a nightmare journey coming from Heathrow. I was lucky enough to have a press pass for the event since I was helping Bunny with her Unconventional blog, Trek News and Views and of course our own site the Holodeck. I want to thank Bunny and Showmasters for allowing me to have a pass and covering the event. Once I was in the event I had some good advice from Bunny to collect some talk tickets for myself to ensure I did not miss out. 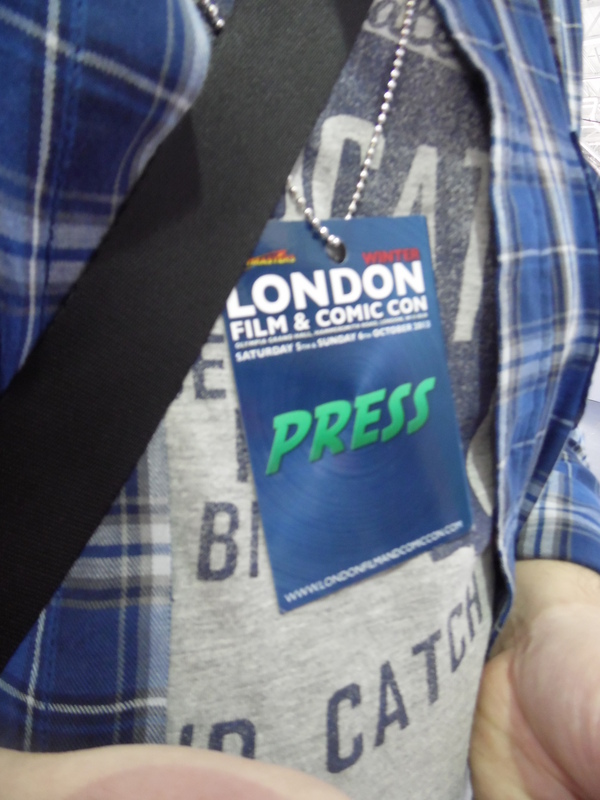 These were for the Doctor Who talk, The Hobbit / Lord of the Rings and of course the Star Trek talk. I was able to get one ticket for each talk and then set about exploring the show. I had never been to Olympia before I was very impressed by the size of the hall. At the far end of the hall was the autograph area. Here all the main guests would be signing and when I walked past I noticed that both Garret and Nicole were there and there queues were small. This was my chance! I would grab some pictures, get their autographs and would have saved myself time in the queue. Before the event I had decided that I would get two cast photos from Voyager and DS9. Nicole and Garrett would be my first signings on both pictures and hopefully over the coming years I could finish both groups. I then went round the hall looking for photos and this is where I got a bit frustrated. 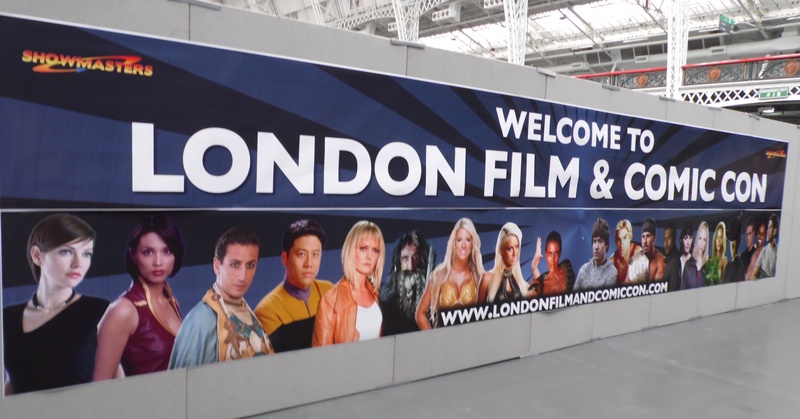 At the last LFCC there were stalls with hundreds of blank photos of every show and star possible. This time there seemed to be an increase of stalls with photos already signed by the actors. I could only find one stall with pictures only and he did not have anything to do with Voyager and DS9. Only Star Trek Into Darkness. It then dawned on me that the Garrett and Nicole would have their own photos for us to sign (again a rookie mistake) and they did. 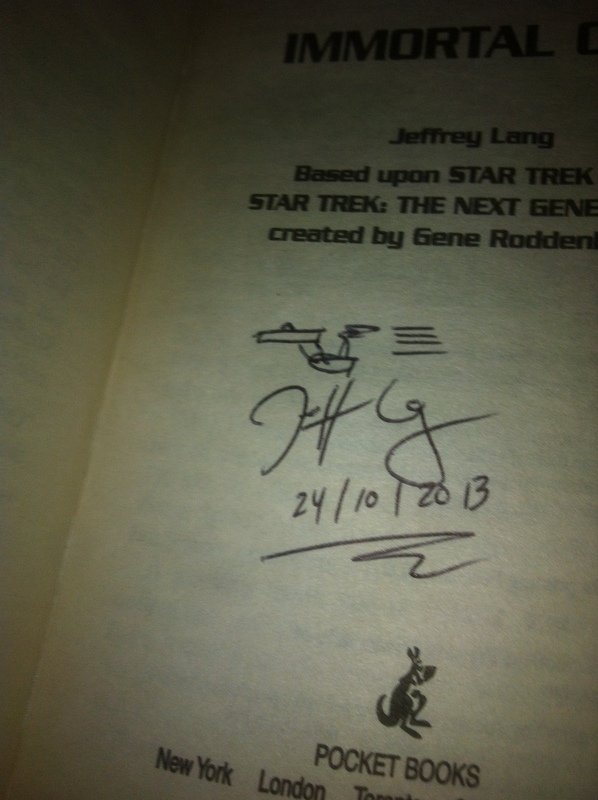 I went to Garrett first and to my surprise and joy he remembered me from Trekology. It really was like catching up with an old friend, we spoke about Bunny & Laura, Trekology, the changes in podcasting and more. He then signed my photo and said we would talk over the weekend. He really is a great guy. I have to say I was really nervous meeting Nicole. Nicole looked stunning although we were later to find out that she was not feeling well and was on medication to help her through the weekend. Before I could say hello Nicole mentioned how smart I was looking and how she loved my t-shirt which had a large geek logo across the top. I blushed almost at once, I could feel my cheeks go red so I quickly mumbled something about how wonderful it was to meet her. I chose my picture and then Nicole signed it for me. These were my first autographs at a con. In the past I have only had photos taken but I am starting to get a mixture of the two now. 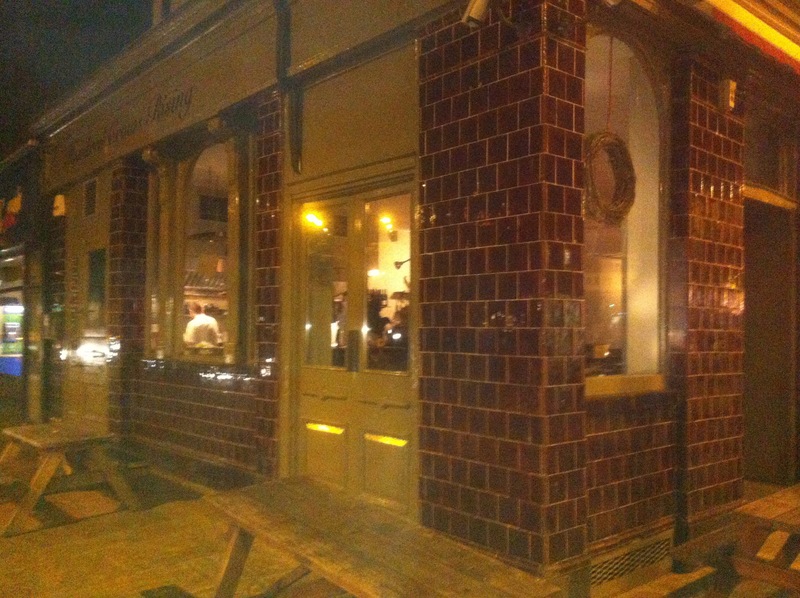 Soon afterwards I met up with Bunny, Laura, Gaz and Craig. It was good to see everyone and after a quick catch up Laura, Craig and I decided to look at all the stalls around the hall but first we would have to have tea. Just like July there were some wonderful stalls offering all types of merchandise. 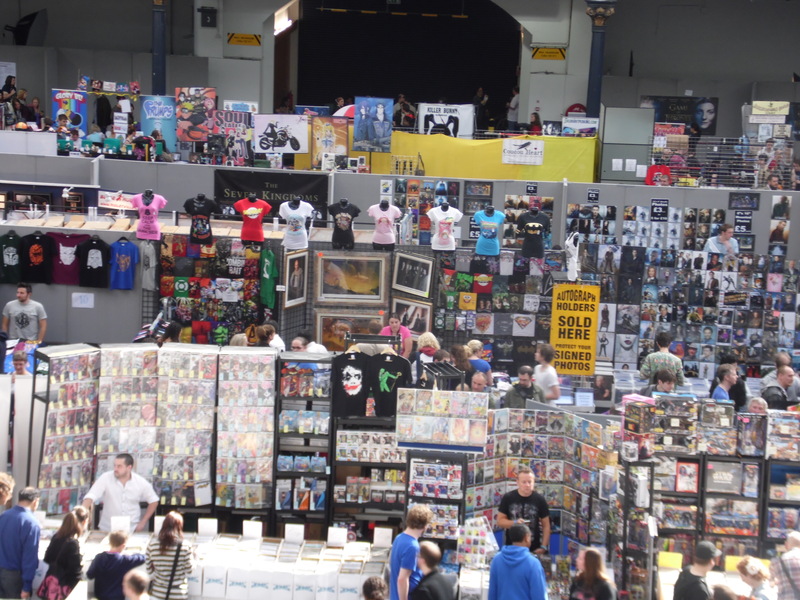 I did notice a large increase in the amount of comic stalls compared to last time and also a large increase in the amount of Doctor Who products on sale. I think over the course of the weekend I must have visited each stall at least three times. I am always impressed by what you can actually buy; some of the art work on sale was simply astonishing. There were three items that did catch my eye on the first day. The first was a Beverly Crusher plate; I have a number of Star Trek plates including Picard, Troi and this looked really good. The second was a post card set from Doctor Who. There were four Doctors but only of their costumes with the words “Who is Returning”. The third was a cast photo from Into Darkness where the crew and Khan are standing together with the Golden Gate Bridge in the background. It really looked good but alas when I went to buy it on Sunday it had sold out! There were products that I had not seen before but also some wonderful items that brought back some childhood memories. There were a lot of old style Transformers toys, Batman toys and much more. I was like a big kid grinning every time I saw something I liked or remembered. With any type of event you always find those fans who love to dress up in the costumes of their favorite characters. WLFCC was no different. 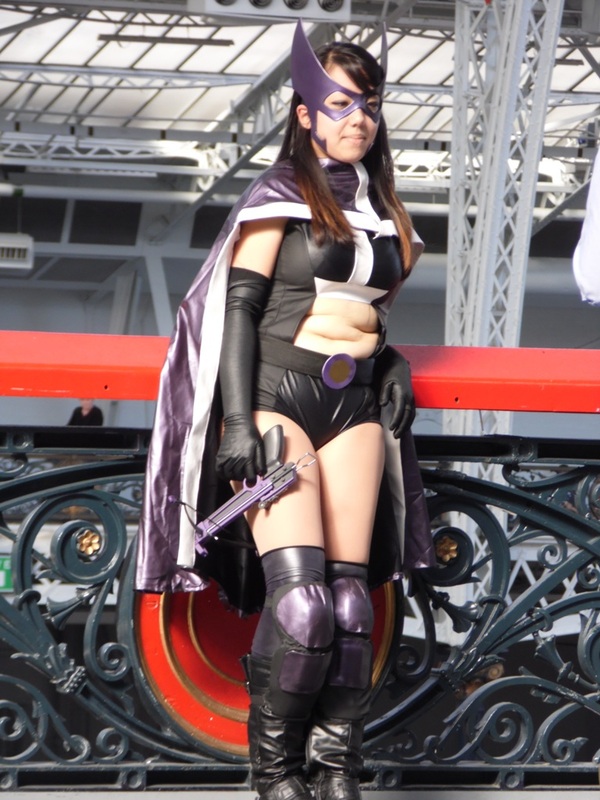 This time around there seemed to me more emphasis on Cosplay. Over the two days I saw some brilliant costumes including Indiana Jones, Stargate, Batman, Joker, Sarah Jane Smith, Superman, Doc Oc, LOTR characters, Huntress, Arrow, Flash and of course Doctor Who. While the outfit worn by the tenth Doctor was the most popular there were quite a few of the fifth Doctor (Peter Davidson). While there were quite a few Star Trek costumes seen over the weekend I did feel that Star Trek lost out to the other franchises. It was soon time for the first talk of the day. This was going to be a Doctor Who talk with some of the stars from the Classic series (since when did we decide to separate the series from classic and modern?). Attending the talk were William Russell (Ian Chesterton), Richard Franklin (Mike Yates), Fernanda Marlowe (Corporal Bell), Carole Ann Ford (Susan Foreman) and Sarah Sutton (Nyssa). This was an interesting talk since some of these actors had worked with William Hartnell, Jon Pertwee, Tom Baker and Peter Davidson. We heard about their views on the new series, most had seen and liked the stories and the actors playing the Doctor. Most agreed that Matt Smith was the best Doctor of the “new” incarnations since he was young but played the part as an old, wise man. They all stuck with their “own” Doctor saying that he was the best one. Sarah Sutton explained she was written out of the series since there were too many people in the Tardis. She did not want to leave and even Peter Davidson tried to have the decision overturned. A shame she left; I remember a young boy having a crush on Nyssa all those years ago. We has some good questions from the audience although I would say that (although I am not an expert) you should target your questions to the guests. As soon as this ended we went straight into the Star Trek talk with Garrett and Nicole. According to Nicole this was the first time that the two had been involved in a talk together (although Garrett thought they had). I have to say the chemistry between the two was really strong; in fact there were times that they didn’t need any audience participation. They were doing fine just chatting to each other. We heard some interesting stories about how when Voyager and DS9 were filming at the same time there were some rivalries between the two shows and at one point they could not eat food from the other show and other petty things. We heard about how hard it was for Kate Mulgrew playing Janeway with all the Paramount “Suits” constantly interfering. Garrett also spoke about the filming the pilot and how they had to re-shoot some of the scenes after the first choice of Captain Janeway Genevieve Bujold left the show. The cast had heard that if they could not find a female lead then a man would be cast and one person would have to leave the show. Garret thought it would be him since he was the new boy with the shortest acting C.V. Nicole commented how ridiculous this was. Nicole also mentioned how she had yet to meet Sir Patrick Stewart and would love to meet him one day. Nicole also spoke about how many times she has auditioned for J.J. Abrams shows but has had no success so far. Both spoke about the new films by J.J and how they were not happy that Into Darkness had missed the “Star Trek” in the story and was just one action ride. Nicole had not seen the film but was not impressed. Nicole and Garrett then spoke about how they became involved in acting. While Nicole had been a child actor Garrett had studied acting (against his parents wishes). We had some good questions from the audience but soon enough we had run out of time. Over the weekend there were various talks on the three talk stages. There were ones dedicated to Cosplay, to comics and shows like Star Trek, The Walking Dead, and Doctor Who etc. Most of the talks were free apart from Michael Shanks and Jon Bernthal. For these two talks they were £10 each which does not seem too bad. There was however, one flaw in Showmasters plan. The main talk stage was directly next to the balcony and as a result people were resting against the rails and were taking in the talks. Of course for the free ones there is no problem but soon enough Showmasters realised and the area directly above the talk area was sealed off. I have to say that this should have been thought of before the event, just seems daft half way through the first day. I was also surprised that one of the paid talks were half empty. Perhaps Showmasters should look at how they decide on what should or should not be a paid talk? The afternoon was spent catching up with friends including Jon, discussing the talks and what things we wanted to do over the rest of the weekend. We based ourselves upstairs on the balcony and were lucky enough to see Billie Piper (being escorted everywhere), Michael Shanks and a few more of the guests. Sounds very daft but you can’t help but get a buzz when you see them walk past you. Billie looked stunning as always. You really want to say hi or ask them something but you do have to respect their privacy and not get in their faces. We then spent a couple of hours in Pizza hut where I met Howard, Dave and Leanne (who has a great blog, see below for links). Both Howard and Leanne are experienced convention goers and it was nice to meet them, talk to them about the event etc. I really could learn a thing or two about conventions with Bunny, Howard and Leanne. Between them they must have seen everything at a convention and met so many fabulous people. After one more lap of the event we decided to call it a night. Bunny and I headed off to out hotel in Heathrow where we spent the evening talking about the day and conventions in general. Sunday was a late start for us. I was looking forward to my photo shoots with Garrett and Nicole. Laura and I started the day recording two brief interviews with both Garrett and Nicole. They were so helpful and wonderful. We spoke to Garrett about his upcoming projects, Star Trek Renegades (which Garrett has now left the pilot but will return in the future) and about the event. Nicole spoke about her desire for a curry and a pint, her current projects and how she loves being in London. 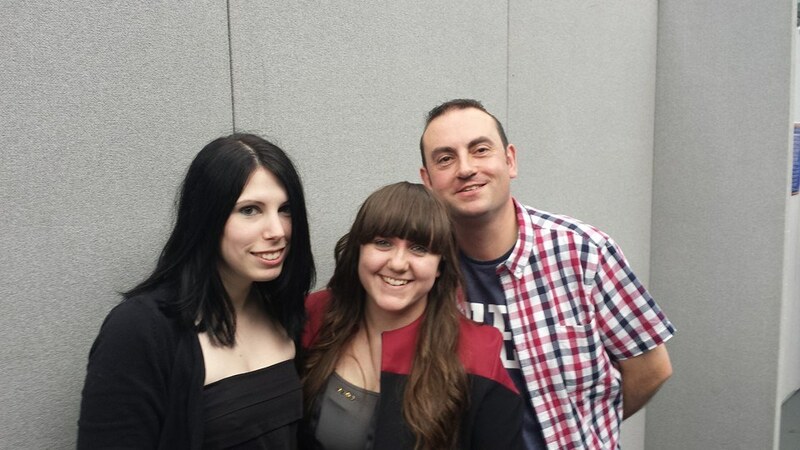 We also spoke about future events including Fedcon next May. I gave into my temptations by purchasing the Doctor Who postcard set and the Doctor Crusher plate. I was contemplating buying some photos to use for autographs but have decided to look online instead. I really do have the autograph bug now. I think each con will be a mixture of photo shoots and autographs now. 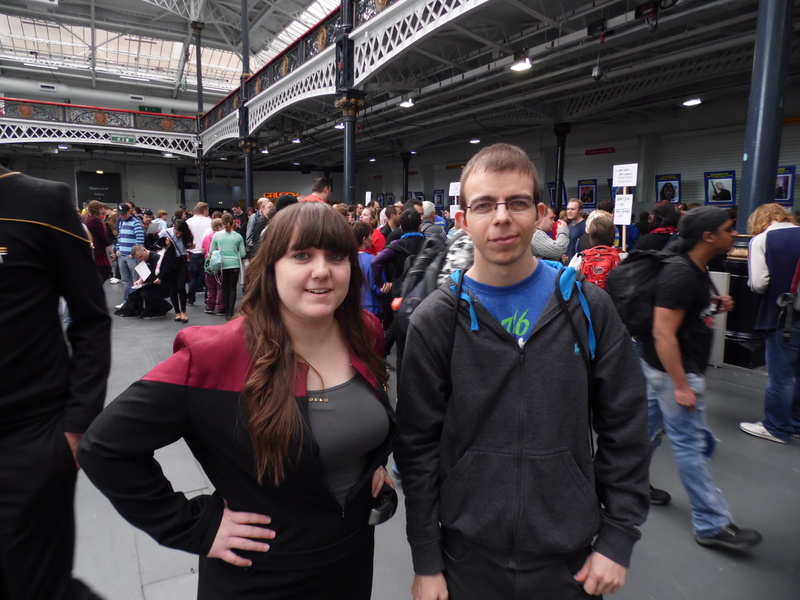 Laura and I then decided to search out as many Star Trek fans and take some pictures. We both felt Star Trek was not as big at the event this time around unlike in July where there were so many of the DS9 cast. We managed to catch up with some fans in some brilliant costumes. 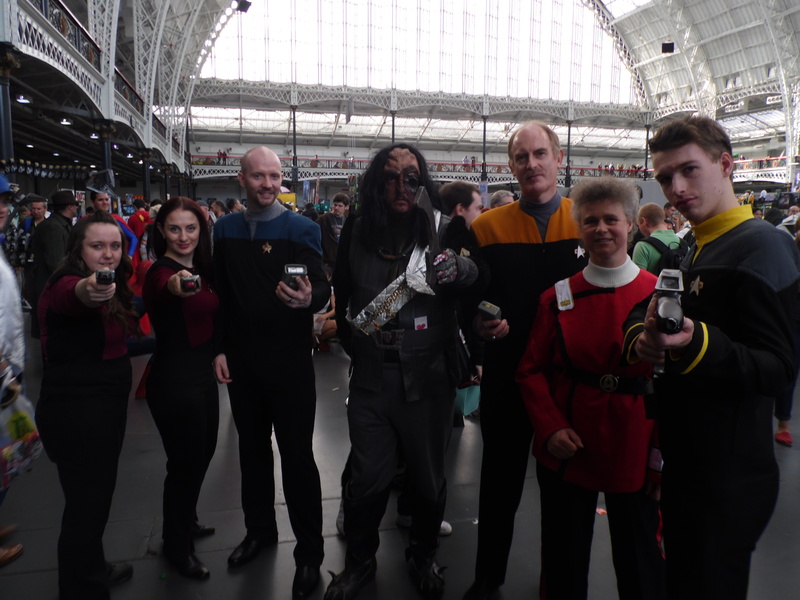 I should mention that as always Laura looked really nice in her VOY costume on the Saturday and TNG on the Sunday. Soon enough it was time for my photo shoots. Garrett was great fun as always and spent some time with us while he was waiting for late arrivals. He really is popular at these events. Nicole was very welcoming too, I think the picture with Nicole looked better than the one with Garrett. Bunny followed me and had the pleasure of being stroked by Nicole; I am not even going to mention how jealous I was…. The last talk of the day was from Garrett and Nicole. I have to say that in the morning Bunny challenged Garrett to give us some new material and I have to say he did not let us down. Nicole was feeling much better from the day before and we could see this when she was directing the master of ceremonies around the stage. We were shown how to do the Star Trek “Shake” which was just hilarious, it seems that it’s just like riding a bike. You never forget! Garrett spoke about the “Chute” which he considered to be one of his best shows while Nicole spoke about “Field of Fire”. When the talk ended Garrett came over to us and asked if that was enough new material for us. We just cracked up laughing. Garrett gave hugs to Bunny and Laura, shook my hand and said he would catch up with us soon. How cool was that! WFLCC was a really good weekend. I think the event itself was planned well (apart from the balcony issues) and again we had a real selection of merchandise. 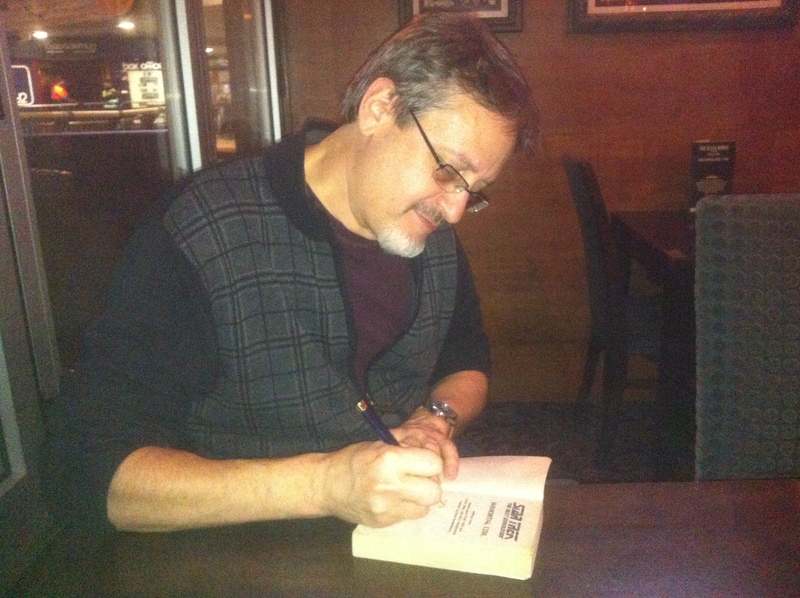 The guests were a mixture from all shows; we had some great comic book guests and authors from across the spectrum. The event itself did not seem as busy as in July but is that because of the guests or that there seems to be an event every few months now? Personally I had my pictures with Garrett and Nicole, I saw Flash Gordon, the Eighth Doctor, Billie Piper and was told I looked good. For me these events are about meeting new friends and spending time with my closet friends. I did all that and more. For me WLFCC was a success. For more photos of the event go here. 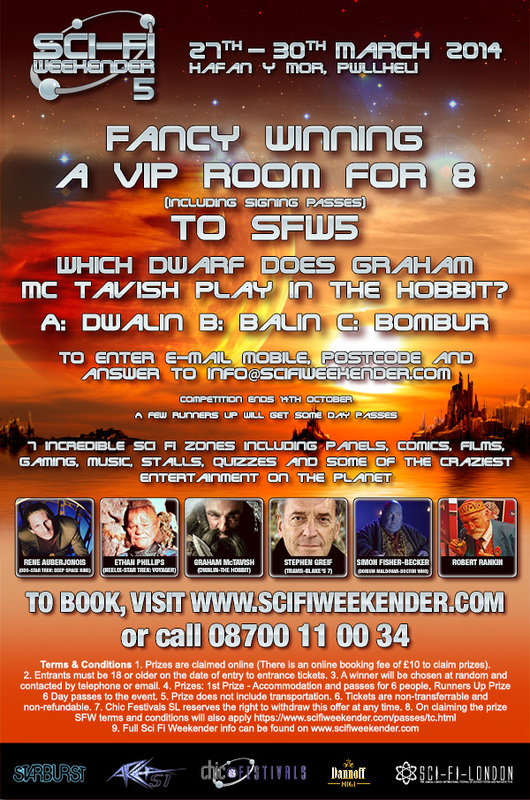 How would you like to win a VIP room for six (including signing passes) for Sci-Fi Weekender 5? 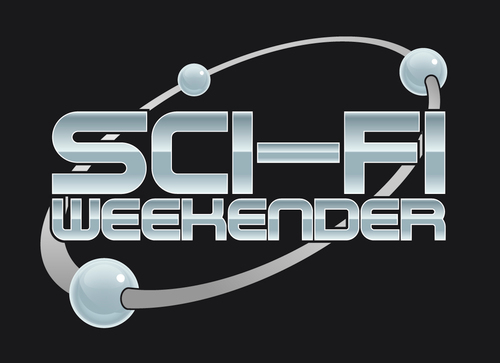 Now in its fifth cycle, The Sci-fi Weekender continues to promise the ultimate Sci-Fi experience. 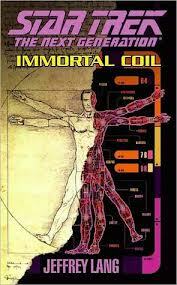 Quite simply it’s a festival of fun and activities for people who love science fiction and fantasy. SFW5 will be packed with activities for fans: big-name guests, interviews, Q&A sessions, movie screenings, comic workshops, video gaming, music, book readings and plenty more. It’s all about bringing like-minded people together for a weekend structured around a core 5 pillars…. the entertaining Imaginarium, the sweeping Masquerade Ball, the Multiple zone culture, featuring, Gaming, Comic, Author, Screening as well as the fiendish Sci Fi London quiz nights. The Sci-fi Weekender attendees will get the chance to fully immerse themselves in a sci-fi & fantasy culture. Fans can discover how comics are made, discuss burning issues with their favourite author, or be among the first to see exclusive screenings of films and TV shows. There are also many autograph opportunities: the full line-up will be revealed over the coming months…although expect some hot news shortly. Above all, though, it’s a chance to hang out with like-minded people and enjoy a few drinks in a cool environment with other fans from around the planet. Which Dwarf does Graham MC Tavish play in the Hobbit? 1. Prizes are claimed online (There is an online booking fee of £10 to claim prizes). 2. Entrants must be 18 or over on the date of entry to entrance tickets. 3. A winner will be chosen at random and contacted by telephone or email. 4. Prizes: 1st Prize – Accommodation and passes for 6 people. Runners up prize – 6 one day passes to the event. 5. Prize does not include transportation. 6. Tickets are non-transferable and non-refundable. 7. Chic Festivals SL reserve the right to withdraw this offer at any time.